Freedom Fall is a twisted fairy tail coming from the brilliant mind of Lisa Rye. The game follows Marsh, who has been taken prisoner and trapped within the top of a tower for reasons unknown to the player. 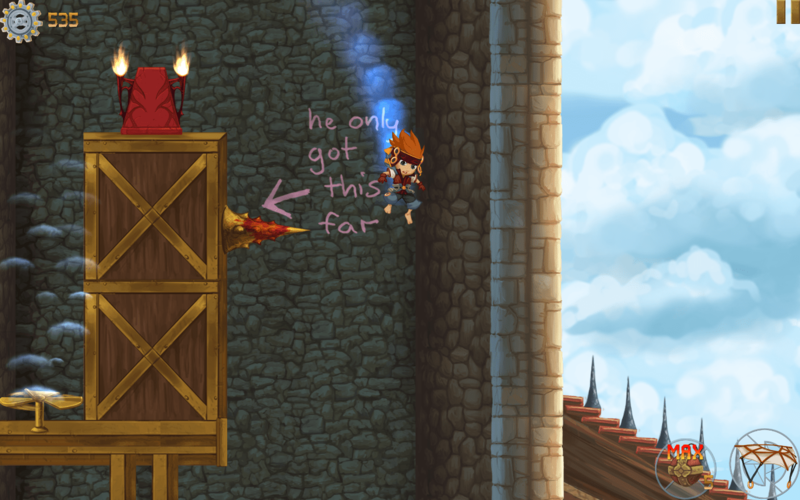 He must fall through the tower to his freedom, avoiding spike traps, fire, lightning, and all sorts of other obstacles. 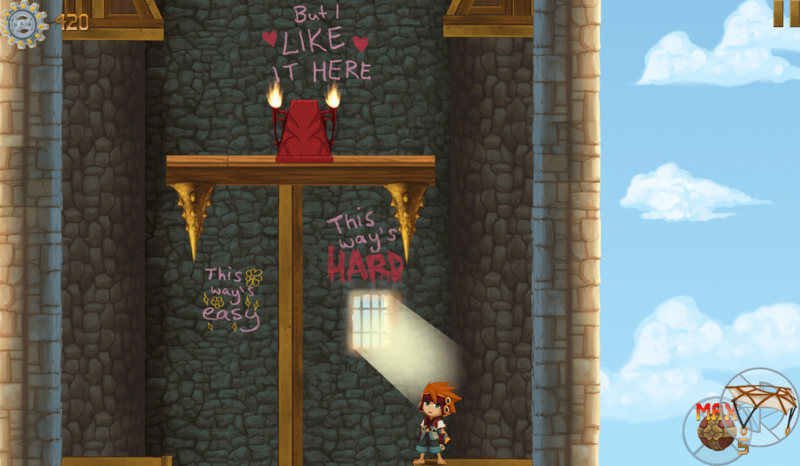 Freedom Fall’s narrative is told in an unusual way; rather than have the main characters of the story (Marsh and the princess) interact directly, the princess pens messages, instructions, and death threats on the wall as he descends the tower. Through them, you learn more about the princess and the tower, and eventually find out why Marsh has been imprisoned. This all culminates in the second to last level, in which the princess’ scrawls demand Marsh proclaim either his innocence or his guilt. This single choice will determine the writing on the wall that you see next, and the will give you one of two endings based on the path you take. 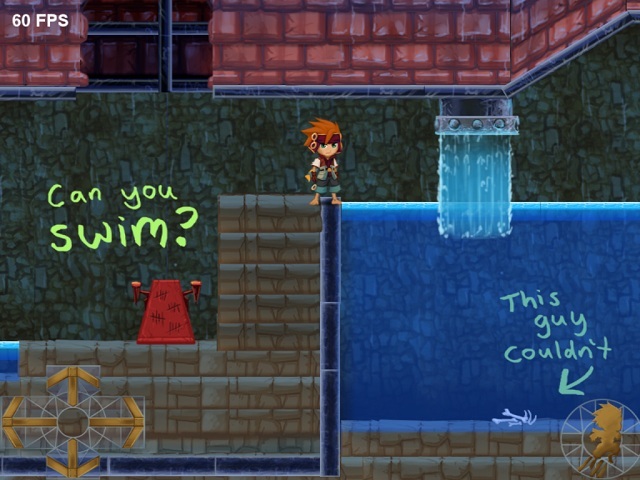 The developer, Lisa Rye, is primarily an artist. She wanted to experiment with a form of storytelling that did not rely on heavy amounts of text, but rather on visual cues. Through them, the story is relayed in bits and pieces as you play, and her wicked sense of humour makes it work. You progress in Freedom Fall by navigating through each level to reach the bottom of that room in the tower. You spend a lot of time falling, but you also jump around and swim to reach the bottom of the tower. In the PC version of the game, you move Marsh using the arrow keys and jump with the space bar. 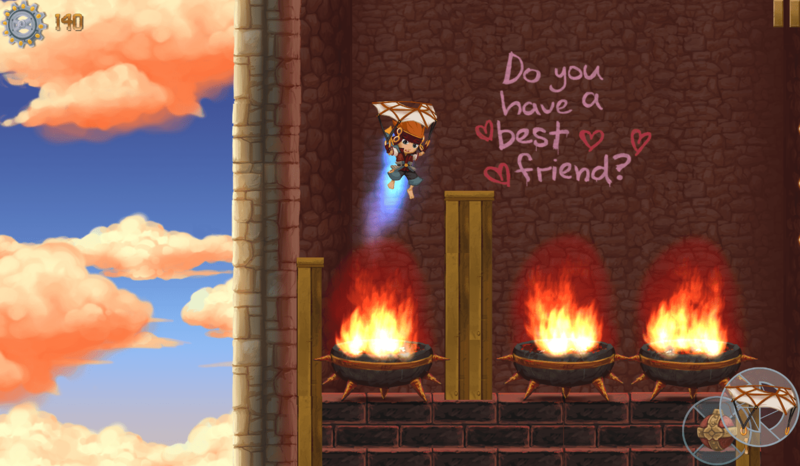 You can also cycle through your equipment with C and lob bombs with V. Bombs can be used to harm the two bosses you encounter, as well as to blow up objects blocking your path. 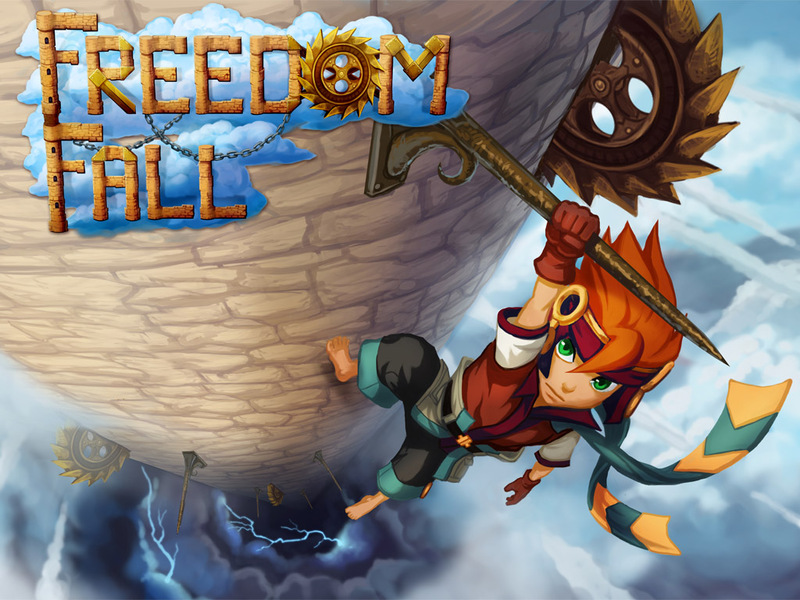 There are 12 levels in Freedom Fall, each of which took me around 5 – 10 minutes to complete. While the game is a short one, it’s a blast to play through, and that dialogue WILL have you rolling around in your chair laughing. Each level forces you to choose between two paths multiple times a level. There are also three special gears to collect in each of the 12 levels, some of which require a particular item to obtain. Every time you fall through a level your time is recorded and your number of deaths noted to come up with an overall level score, which you can try to best every time you play. All of these factors combine to make me want to play through each level multiple times in order to get the best possible score and to gather all of the gears hidden throughout the game. There are no enemies to beat up as you go; save for a couple of boss fights, only the many obstacles set up by the princess hamper your progress. Three new pieces of equipment can be “invented” by Marsh using the gears scattered throughout the levels. Inventing works just like an item shop; Marsh gives up his gears to create each of his three inventions, effectively making gears the game’s currency. These three items use up differing amounts of gears in their creation, and make it easier to stay alive and explore the tower. You’ll need at least one of these to help you out in the later levels, as the game does become more difficult. All of your equipment affects the way you fall through each level, and can be utilized in mid-air with the space bar. Here, you can see Marsh opening up his parachute to catch an updraft. Both the art style and the soundtrack for Freedom Fall suit the game well. They did a great job setting the overall mood of the game; they sounded good and made for some nice background beats for escaping a princess gone mad. Between the fun animations, the tracks playing all through each level and the princess’ comments on the walls, I couldn’t stop smiling, no matter how many times I died (which was a lot). Freedom Fall is an enjoyable game which was so fun I could forgive its short length. The characters and their predicament are hilariously told through inventive visuals that kept me giggling throughout the entire game, and the music and art style lend themselves well to the game’s overall mood. I would recommend this to anyone. Review copy supplied by publisher. This review was written using the PC version of the game. Previous Post:Vote-to-Localize SEGA and Konami Poll is Live — We Need Your Votes!